12:30 pm Credit Rating: Hinduja Ventures informed exchanges that SMERA Ratings, a credit rating agency has assigned A+ to company in respect of its credit facilities of Rs 100 crore. The rating outlook is ‘Stable’. Grant Investrade Limited, a wholly owned subsidiary of the company, has been assigned by SMERA, rating A+ for term loan facilities amounting to Rs 200 crore and IndusInd Media and Communications, a material subsidiary of the Company has been assigned by SMERA, rating A for various bank facilities aggregating to Rs 792.83 crore and A1 for credit facility amounting to Rs 7.17 crore. 12:20 pm Shakti Pumps in focus: Shakti Pumps’ R&D unit(s) in Madhya Pradesh is registered with the Department of Scientific & lndustrial Research (DSF) for the purpose of availing customs duty exemption. The transmission system includes establishment of a 765kV D/C Transmission line from Vindhyachal pooling station to Varanasi and traverses the States of Madhya Pradesh and Uttar Pradesh. The transmission system is to be constructed in a period of 40 months. 12:00 am Order Win: The construction arm of Larsen & Toubro has won orders worth Rs 1,521 crore. Heavy civil infrastructure segment has secured an order worth Rs 1,396 crore from the West Bengal Highway Development Corporation Limited (WBHDCL) for the construction of a six-lane extra-dosed bridge across the river Hooghly besides existing Iswar Gupta Setu at Kalyani, West Bengal. Technology) for the implementation of ‘Jharkhand State Wide Area Network (SWAN) 2.0 –JHARNET 2.0′. 11:55 am Cox & Kings’ new hotel: Cox & Kings owned MEININGER Hotels and investor LGIM Real Assets (Legal & General) have signed an agreement for a hotel in Glasgow. The hotel will offer 160 rooms and 590 beds. The opening is scheduled for 2020. 11:50 am Order Win: Steel Strips Wheels said SSWL Alloy wheel Mehsana plant has bagged orders from 6 OEMs till now. 11:45 am Fraud: Ashiana Housing informed exchange that it has recently come across 2 instances wherein fraud (involving misappropriation of funds) has been committed on the company. While the matter is still under investigation, total value of the fraud, in terms of potential loss to the company is around Rs 50 lakh, it added. The company is in the process of taking appropriate action in this regard including recovery of money. “These are one off instances and the company has adequate internal controls commensurate with its size and nature of operations. However, company is in the process of further evaluating the internal controls to ascertain scope of improvement,” it said. 11:42 am Market Update: The market continued to trade lower with the Sensex falling around 150 points, following negative lead from global stocks. The Nifty continued to struggle below 10,150 levels ahead of expiry of March derivative contracts, down 47 points. Other Asian markets like Nikkei, Hang Seng, Shanghai and Kospi declined 1-2 percent as US stocks fell sharply on the back of declines in technology names. PSU Bank, IT and Auto indices rebounded while Metals, Pharma remained under pressure. “We are excited to receive this valuable order as Nigeria is one of the largest countries in South Africa,” Omprakash Garg, CMD, Cupid said. 11:31 am Board Meeting: VST Industries informed BSE that a meeting of the board of directors is scheduled to be held on April 12 to consider and approve the audited financial results for the year ended March 31, 2018 and to recommend declaration of dividend if any, for the financial year ended March 31, 2018.
including operation & maintenance for five years thereafter. Research Institute (NEERI) under the Council of Scientific & Industrial Research (CSIR), which is an environment friendly technology. The order will be executed by BHEL’s Project Engineering & Systems Division (PESD), Hyderabad. 11:05 am Rupee Trade: The rupee wiped out early gains, falling 3 paise to 65 against the US dollar. It opened higher by 10 paise at 64.87 a dollar at the forex market on increased selling of the greenback by exporters amid foreign fund inflows. 10:55 am PE Investments at all-time high: Private equity investments hit an all-time high of USD 21 billion in 2017, recording a 54 percent jump in value terms over last year, largely driven by big-ticket transactions, says a report. According to assurance, tax and advisory firm Grant Thornton, the year 2017 was a milestone year for PE investments as 735 transactions were announced worth USD 21 billion. 10:45 am Market Update: The market extended losses on the back of weak global cues, with the Sensex falling 200 points. The Nifty continued to trade below 10,150 ahead of expiry of March futures & options contracts today, falling 60 points. All sectoral indices were in the red, with the Nifty Metal, PSU Bank falling over a percent. Midcaps also traded in line with frontliners, with the Nifty Midcap falling over half a percent. 10:20 am UK-MHRA Inspection: Indoco Remedies share price dropped 10 percent after the UK healthcare regulator issued seven observations to company’s Goa plant I. The drug maker informed exchanges that, United Kingdom – The Medicines and Healthcare Products Regulatory Agency (UK-MHRA) inspected drug manufacturing facility (plant I in Goa) during March 14-16, 2018. Subsequent to the inspection, the UK-MHRA issued observations, which include 3 critical and 4 major, the company said. Goa Plant I manufactures solid dosages, liquid orals and external preparations. 10:10 am Buzzing: Share of Biocon gained 2.4 percent as it has received marketing authorization approval from the European Commission. Mylan NV and Biocon announced that their co-developed biosimilar insulin glargine Semglee has received marketing authorization approval from the European Commission following the positive recommendation by the committee of Medicinal products for Human use of European Medicines Agency. Semglee 100 units/ml 3 mL prefilled disposable pen for people with diabetes, is the first biosimilar from Biocon and Mylan’s joint portfolio to be approved in Europe. Additionally, the Therapeutic Goods Administration (TGA), Australia has also approved biosimilar insulin Glargine Semglee 100 IU/ mL 3 mL prefilled pen for people with diabetes in Australia. 10:01 am Listing: State-owned Hindustan Aeronautics share price made a weak debut on Dalal Street, falling more than 4 percent from its final issue price of Rs 1,215. 9:55 am Pre-Opening Listing: Hindustan Aeronautics share price settled at Rs 1,152 in pre-opening on the National Stock Exchange, down 5 percent from issue price of Rs 1,215 per share. 9:45 am Market Update: The market remained under pressure on the back of global weakness, with the Sensex falling around 150 points. The Nifty is trading below the 10,150 levels ahead of expiry of March derivative contracts, down 48 points. The Nifty Midcap index also traded in line with frontliners, falling half a percent. About two shares declined for every share rising on the BSE. 9:34 am Buzzing: Persistent Systems share price dropped more than 9 percent after the company lowered its revenue and margin growth for last quarter of financial year 2017-18. The Midcap IT company informed exchanges on Tuesday that it is expecting a decline in IP revenues during Q4 FY18, which will impact revenue and EBIDTA margin for the quarter. “IP revenues have seasonality and tend to fluctuate on a sequential quarter-on-quarter basis. While we continue to see good overall growth for our IP revenue portfolio, relative quarter-on-quarter decline follows a strong Q3 FY18 (last quarter of calendar year 2017),” the company said in its filing. It expects the sequential drop in IP revenues to be about USD 8 million for this quarter, but it said overall, the business outlook for the upcoming year (FY 2018-19) remained strong with revenue growth expected to exceed NASSCOM guidance for the industry. 9:27 am Edelweiss maintains Buy on Persistent: Persistent Systems has informed stock exchanges that the company’s Q4FY18 IP revenue is likely to dip by USD 8 millionn. While a USD 3-4 million fall was anticipated on account of seasonal weakness in the Alliance business, we believe the additional decline is on account of ramp down in one of its IP products. However, we expect the company to recover the lost revenues over the next two quarters. Considering high margins in IP-led business, profitability too is expected to remain under pressure during the quarter. The slip notwithstanding, management reiterated strong business outlook and does not foresee any structural challenges. We await further clarity before revising our estimates. Edelweiss maintains Buy with a target price of Rs 1,014 per share. 9:20 am Demerger: Fortis Healthcare (FHL) said its board has approved demerger of its hospitals business, which will be acquired by Manipal Hospitals and TPG Capital, along with the sale of 20 percent stake in diagnostics chain SRL Ltd., in a Rs 3,900-crore deal. “The Board has also approved sale of its 20 per cent stake in SRL Ltd. to Manipal Hospitals. The resultant entity Manipal Hospitals will be a publicly traded company listed on NSE and BSE. The remaining FHL will be an investment holding company with 36.6 percent stake in SRL,” the company said in a statement. 9:15 am Market Update: Benchmark indices opened lower on the day of expiry of March derivative contracts, tracking negative lead from global stocks. 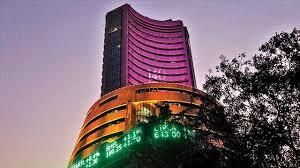 The 30-share BSE Sensex was down 124.15 points at 33,050.24 and the 50-share NSE Nifty fell 56.10 points to 10,128.10. Tata Steel, Vedanta, SBI and Yes Bank were lowers in early trade. Nifty Midcap was down 146 points. Kwality plunged 20 percent, hitting fresh 52-week low. Fortis Healthcare, Persistent Systems, Edelweiss Financial, Delta Corp, Balrampur Chini, Indoco Remedies, Bandhan Bank, Cummins and IDBI Bank fell up to 9 percent. Tejas Networks, Bodal Chemicals and Biocon gained. 9:12 am Rupee Trade: The Indian rupee opened higher at Rs 64.88 per dollar on Wednesday versus 64.98 yesterday. 9:10 am Pre-Opening Settlement: The market was lower in pre-opening settlement. The Sensex was down 76.30 points at 33,098.09 and the Nifty fell 40.60 points to 10,143.60. 9:09 am Listing: State-owned Hindustan Aeronautics will list its equity shares on exchanges today. The final issue price is fixed at Rs 1,215 per share. The Rs 4,229-crore initial public offer of state-owned Hindustan Aeronautics was subscribed 99 percent during March 16-20, 2018, supported by QIB. 9:07 am Stocks in News: TPG-backed Manipal Hospitals buys Fortis Healthcare, to invest Rs 3,900 crore. Fortis Healthcare Board approved the demerger of its hospitals business into Manipal Hospital Enterprises. The Board has also approved sale of its 20 percent stake in SRL to Manipal Hospitals. Lupin: It has received US FDA nod for generic of Clobex Spray. State Bank of India: The bank is mulling the possibility of merging SBI Card JV entities with itself. Dena Bank: Gets shareholders’ nod for the issue of shares worth Rs 3,045 crore to the government. 9:00 am Market Check: The market started off last day of the truncated week on a flat note, with the Sensex rising 57.14 points to 33,231.53 and the Nifty falling 0.50 points to 10,183.70 in pre-opening trade. It is expected to be weak day as global markets are under pressure and even SGX Nifty indicated the weak opening, falling 64 points. Fortis Healthcare tanks 10 percent after Manipal deal. Kwality fell 20 percent. Wall Street closed sharply lower Tuesday, with each of the major US indexes suffering their fourth decline in five sessions, fueled by a selloff in the tech sector. Tech stocks, among the best performing sectors of the bull market, have been under pressure recently as concerns about government regulation stemming from their strong growth and privacy questions surrounding Facebook, Reuters reported. The Dow Jones Industrial Average fell 344.89 points, or 1.43 percent, to 23,857.71, the S&P 500 lost 45.93 points, or 1.73 percent, to 2,612.62 and the Nasdaq Composite dropped 211.74 points, or 2.93 percent, to 7,008.81. Asian stocks posted declines after US stocks fell sharply on the back of declines in technology names. That cut short a rally seen in Europe and Asia’s Tuesday session linked to an apparent easing in trade-related tensions, CNBC reported. The Nikkei 225 fell 2.15 percent in Tokyo, with the stock average reversing most of its gains made in the overnight session. The broader Topix was down 2.04 percent.